Sometimes you stumble across a portfolio where the artist only has a couple of comic based pieces, other times there can be just one work so brilliant, you'd risk being stoned to death by fellow art lovers for putting something else beside it. These are Random Works of Wow and illustrating the point this week is Australian Shane Braithwaite with The Incredible Hulk. 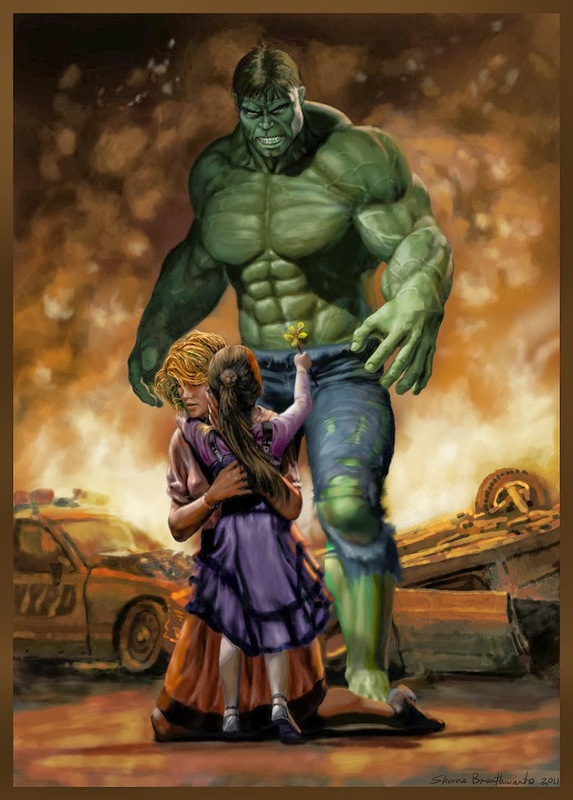 By contrasting a hulk of pure emotion, a distraught yet relieved mother and a gentle girl who unafraid offers the monster a flower, Shane renders one of the best done-in-one images of Marvel's Jade Giant ever. The monochrome background though chaotic, absorbs the mother into the backdrop, making sure your focus is squarely on the beauty and the beast. The only question is - what will Hulk do next? While this reminds me of those classic Hulk scenes like John Byrne used to specialise in, where the Hulk escapes to consolidate in the woods, yet surrounded by the peaceful animals of nature, sooner or later he comes across one that annoys him or won't go away, leading Hulk to 'Smash! ', the big green wouldn't do it to a wee girl would he? What do you think? To see more of Shane's fantasy based portfolio, click here.